It's actually become and annual tradition..we started going four years ago when we were just getting to the "serious dating" stage. We take a trip to Boston for some great food in the North End, some Christmas shopping, and a quick little getaway in the chaos that is holiday time. This year we stayed at The Langham, Boston. It's right in the heart of the financial district. The room was very nice, but no free breakfast. A pretty big drawback in my book! We decided to walk to dinner, although it was pretty windy and cold, and saw this along the way, and I just loved it. We got to dinner, at Trattoria di Monica on Prince Street in the North End. It came pretty highly recommended, and being the research geek I am, I read tons of online reviews. It was exactly the type of restaurant we love. Small, great atmosphere, romantic (ok, that's my favorite, not Rob's), and amazing food. Very cozy on a cold wintery night. Even though it was tiny, Rob managed to snap a few pics, and caught me smiling at the amazing choices. At least this time I wasn't tweeting, or updating my Facebook page, which is what he usually catches me doing. 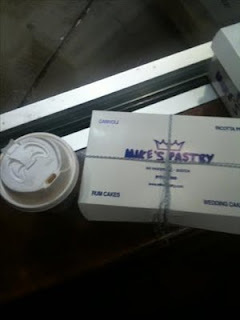 After dinner we stopped at Mike's Bakery, on Hanover Street, which was actually rockin' at 10:30. There were literally throngs of people going in and out. Some sitting with coffee, some taking boxes of sweet deliciousness home. That I did manage to tweet about. I got a decaf cappucino, and about 8 different chocolate treats. Giant peanut butter cups, giant chocolate dipped pretzel rods with toffee crumbs on top, coconut clusters...oh lord. All of them were amazing, and we actually have a few left. When we got back to the hotel, the concierge actually managed the truly rare and elusive photo of Rob AND Rebecca. These don't happen often, so I was glad it came out as well as it did. The next morning we went to Sowa Holiday Market, which is a fantastic show featuring 80 amazing artists and craftspeople. I tell myself that I'm there to buy gifts and then manage to come home with presents for myself! My favorite artist was there, James Polisky. He designed my logo. He has an amazing perspective. He manages to show the darker side of people, kids, animals, you name it, with what to me feels like a beautiful, funny overlay. For some reason, his work just speaks to me. As we were eating lunch on Newbury Street, I was looking out the window and saw all kinds of people in Santa hats run by one block up. As luck would have it 5 minutes later, the Speedo Santa Run went right past us. I had never heard of it, but I guess it's to raise money for a few local charities. Needless to say Rob got TONS of pictures, but just to give you a flavor...these people were CRAZY. As always, it was a wonderful, memorable trip. We will most definately be going back next Christmastime. boston is wonderful. small and manageable. loved the comments. this is wonderful!!! I love what you write about Rebecca! !